Ford (F) is still promising that 2015 will be a "breakthrough year" for profits, but that breakthrough hasn't come quite yet. Ford reported a net profit of $924 million for the first quarter. That was a bit less than it earned a year ago, and a bit less than Wall Street had expected. Ford shipped fewer cars and trucks during the first quarter, and its revenue was down. But behind the unimpressive numbers is a good story: Ford is still on track for a very big gain later in the year. So often with Ford, the story starts with its huge-selling F-150 pickup. The F-150 is arguably Ford's most important product, anywhere in the world -- and any shortage of F-150s is likely to hit Ford's bottom line hard. That's exactly what happened in the first quarter. Ford makes the F-150 in two factories, and converting those factories to build the all-new aluminum-bodied truck has been a complex and expensive process. The first of those factories to be converted, Ford's Dearborn, Michigan, plant, started building the new truck at the end of November. But the second factory, near Kansas City, was closed for much of the first quarter as Ford made the extensive renovations needed. That made a big dent in supplies. In an interview, Ford Chief Financial Officer Bob Shanks said that wholesale deliveries -- shipments to Ford's dealers -- of the new F-150 were down 40 percent from Ford's F-150 shipments in the first quarter of last year. Ford's overall pickup sales were actually up slightly during the quarter, but that's because dealers were selling down the last of their 2014-model trucks. That drop in wholesale shipments cost Ford quite a bit of money. A similar (but simpler) transition is going on with Ford's Edge SUV. There's an all-new model that has just begun shipping to dealers, but meanwhile the dealers are mostly sold out of the older version. Ford's shipments of the Edge were down by more than 50 percent, Shanks said, and sales dipped sharply. Both should recover soon. But there's good news, too. The F-150s that have reached dealers so far have been selling quickly, and at great prices. And Ford's Mustang, new last year, is also selling very well and generating great profits. Once dealers have good supplies of the new F-150 and Edge -- this summer -- Ford's earnings should jump. This story has been playing out for a while, and it's being repeated in other parts of the world. Ford's newest products are generating more profits per sale than the cars and trucks they replace, but the process of launching new products creates shortages that hurt Ford's profits in the short term. For instance, Ford dealers in China are also waiting for the new Edge, and for a new Chinese version of the big Taurus sedan. Ford will begin building both in an all-new factory in China later this year. Meanwhile, Ford is working on increasing production at its other Chinese factories: For a while last year, demand for Ford's cars and SUVs exceeded supply. That was a nice problem to have, but it was still a problem. 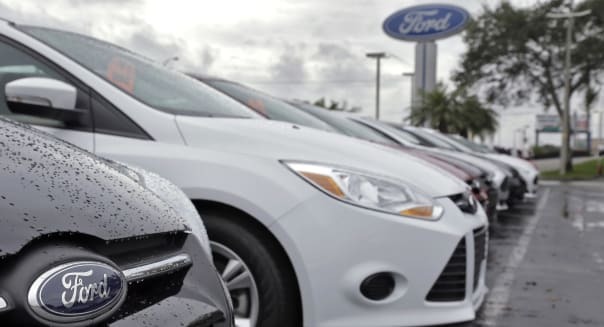 Ford recently bought a factory from a Chinese automaker, and it's planning a new round of construction, all to keep up with booming demand in the world's largest car market. In Europe, dealers are just starting to get good supplies of the new Mondeo sedan, a near-twin of the Fusion that Ford began producing in Spain a few months ago. Ford lost money in Europe in the first quarter, but it expects better results later this year as -- again -- more new products start to arrive at dealers. But the good news is that when those new products do show up, Ford's results shine. In Brazil, where tough economic conditions have taken a bite out of new-car sales, Ford has gained market share and boosted its per-sale profits with its all-new Ka. The Ka is a small sedan, one size smaller than Ford's Fiesta. It's very popular in South America. Ford introduced an all-new version of the Ka in the second half of last year, and it's selling very well -- and earning more money per sale than the old version. Later this year, Shanks said, Ford will roll out a version of the Ka, renamed "Figo," to customers in India. The new Figo will be built at an all-new factory that, once again, is expected to start production in the second half of the year -- when it's expected to boost Ford's profits in that part of the world, too. Shanks and Ford CEO Mark Fields reiterated Tuesday that they expect Ford's pre-tax profit for the full year to come in between $8.5 billion and $9.5 billion, far ahead of the $6.3 billion it earned in 2014. They're very confident that the investments that Ford is making now will lead to big profits later in the year. As long as the U.S. economy stays on track, the second half of 2015 should bring a lot of good news for Ford investors. Motley Fool contributorJohn Rosevearowns shares of Ford. The Motley Fool recommends and owns shares of Ford. Try any of our Foolish newsletter servicesfree for 30 days.Check out The Motley Fool's free report onone great stock to buy for 2015 and beyond.​"